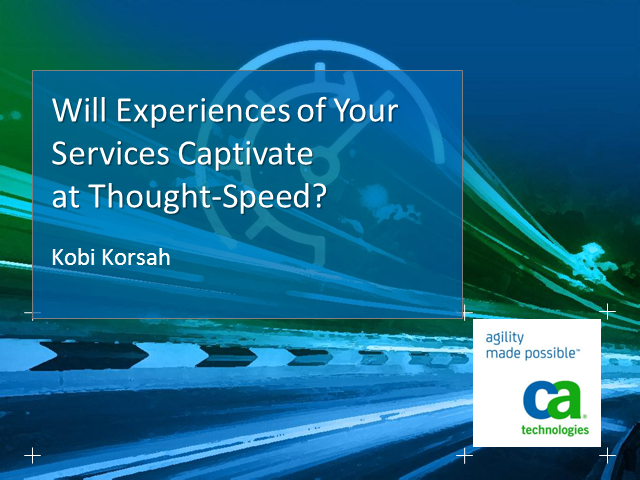 Will Experiences of Your Services Captivate at the Speed of Thought? The revolution driven by mobile and cloud technologies is redrawing business fortunes. Always-on customers armed with smart technology and unlimited choices at their fingertips are reshaping markets at the speed of thought. Meanwhile, competitors and innovative new foes are applying this 21st Century IT to revitalize familiar offerings, build new services, and even create new markets to captivate customers. Despite a flat IT budget and limited resources can you afford not to increase IT reaction speed and innovation? What will slow reactions or service experiences do to your business? How realistic are your service innovation prospects or chances of playing in those new markets? Too much time and resource is wrapped up in ‘keeping the lights on’. Not nearly enough is spent on innovation to deliver strategic business advantage. Join us and Ignite IT to transform your organization from strictly maintaining technology to driving new business innovation by improving efficiency and harnessing IT complexity to deliver business sophistication. Title: Will Experiences of Your Services Captivate at the Speed of Thought?